Better than a “Two for One” deal …….. 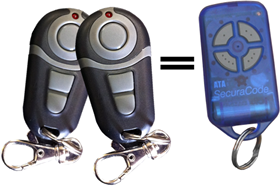 These ultra light weight remotes that are much sturdier than the original ATA units. Our most common remote at an uncommon special price. Unfortunately we see heaps of these blue remotes with broken battery compartments and faulty buttons. After extensive research we’ve located an amazingly well priced substitute. It programs to your door just like the original but has a much more robust design. It is very lightweight, making it perfect for use on your car key ring. even the other alternatives on ebay aren’t as good as this deal!